The book's concerns are largely epistemological, a recurrent theme being that there are some things which must be exempt from doubt in order for human practices to be possible, including the activity of raising doubts: "A doubt that doubted everything would not be a doubt" (OC450). The book takes as its starting point the 'here is one hand' argument made by G. E. Moore and examines the role of knowledge claims in human language, particularly of "certain ('gewisser') empirical propositions", what are now called Moorean propositions or Moorean certainties. An important outcome is Wittgenstein's claim that all doubt is embedded in underlying beliefs and therefore the most radical forms of doubt must be rejected since they form a contradiction within the system that expressed them. Wittgenstein also sketched novel refutations of philosophical skepticism in various guises. "An extraordinary thing has happened to me. About a month ago I suddenly found myself in the right frame of mind for doing philosophy. I had been absolutely certain that I'd never again be able to do it. It's the first time after more than 2 years that the curtain in my brain has gone up. -Of course, so far I've only worked for about 5 weeks & it may be all over by tomorrow, but it bucks me up a lot now." Nevertheless, on the same day he recorded (after OC532): "I do philosophy now like an old woman who is always mislaying something and having to look for it again: now her spectacles, now her keys." A week and a half earlier he had written a similar note before OC471: "Here there is still a big gap in my thinking. And I doubt whether it will be filled now." ^ Wittgenstein, Ludwig (1969). On Certainty. New York: Harper and Row. p. vie. ISBN 0-06-131686-5. ^ Malcolm, Norman (1984). 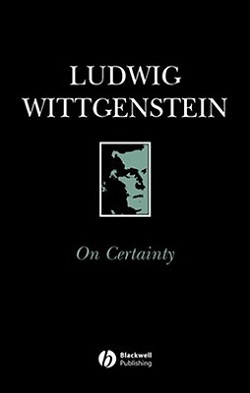 Ludwig Wittgenstein: a memoir (2nd ed). Oxford: Oxford Univ Press. p. 134. ISBN 0-19-924759-5. Jesús Padilla Gálvez, Margit Gaffal (Eds. ): Doubtful Certainties. Language-Games, Forms of Life, Relativism. (2nd edition) De Gruyter, Berlin, 2013, 978-3-11-032192-0.